The Saturn manufacturing plant in Wilmington, Delaware. Photo Courtesy of SaturnFans.com. Photo by Charlie Eickmeyer. By the late 1980s, some American automobile companies wanted to try the Japanese production method of having small teams of workers assemble a major portion of an automobile and take responsibility for the quality of their work. This approach was in sharp contrast to the traditional American assembly line in which each worker does one small task repeatedly as parts move by on an automated assembly line, and mistakes do not show up until the final product is inspected much later on. To introduce this method within its unionized work force, General Motors set up a new plant to produce a new line of automobiles, the Saturn. They negotiated with the UAW to permit broader and more flexible job categories at the Saturn factory, so the workers could cooperate as a team and perform a wide range of jobs as needed. 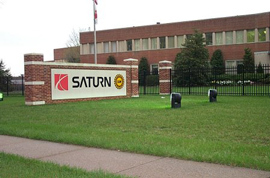 The first Saturn plant was built in Tennessee, a right to work state, to avoid UAW influence.